UPDATE: You can get the full cost breakdown here (4/17). “This isn’t the most exciting presentation you’ll see from us this year, but this is a very important matter to us and our customers,” began Mr. Bertrand Lessard, Managing Director of Ford Philippines as he opened what the company has been doing to improve cost of ownership. Listening to customer feedback from the showroom to social media, Ford is taking the first step in improving its aftersales experience. Starting April, Ford Philippines will be implementing a standardized “scheduled service maintenance” pricing to all dealers across the archipelago. 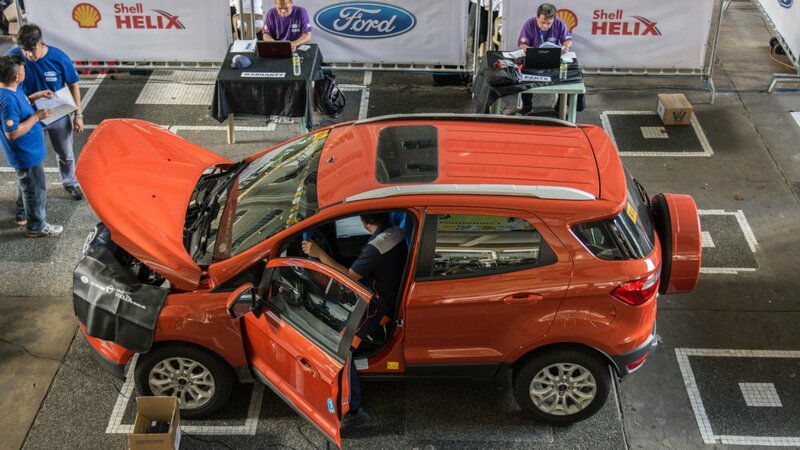 The program, which initially covers Ford Philippines’s so-called big three: EcoSport, Ranger, and Everest, aims to make Ford’s cost of ownership one of the most competitive in the market as well as give customers a more compelling offer when it comes to scheduled service maintenance. With this announcement, Ford keeps the frequency of scheduled service visits at every six months or every 10,000 kilometers (whichever comes first) but also reduces the out-of-pocket costs by an average of 17 percent (parts and labor combined). The scope of the price reduction covers the following components: fully-synthetic engine oil, oil filter, engine air filter, pollen filter, fuel filter, brake fluid, spark plugs, gasket drain plug, and labor cost based on twice-a-year service intervals. Other non-warranty items such as light bulbs, brake pads, suspension bushings, and collision parts are not included in the program given that wear rates vary with each Ford customer and/or vehicle. These items may still have pricing that varies from dealer to dealer given factors such as shipping rates. By Ford’s own calculations, the 5-year scheduled service maintenance cost for the Ranger pick-up truck goes down by 15 percent (~P 140,000 to ~P 120,000); the Everest SUV by 18 percent (~P 150,000 to ~P 125,000); and EcoSport sub-compact SUV by 20 percent (~P 70,000 to ~P 50,000). Currently, this standardized scheduled service maintenance pricing is applicable only to Everest, Ranger, and EcoSport (model year 2012 and up) because it represents 90 percent of Ford Philippines’s total sales volume. However, the company is working to include other vehicles such as North American-sourced units such as the Explorer and Mustang and its passenger car line. Furthermore, for the sake of transparency, Ford Philippines will be posting the price of its scheduled service maintenance on its website. Authorized Ford dealers across the country are also required to post this standardized pricing on their respective websites as well. Another bit of good news is Ford Philippines’s re-introduction of its Scheduled Service Plan or SSP. Applicable to all Ford vehicles, SSP is a pre-paid scheduled service maintenance plan that covers all scheduled service maintenance costs (parts and labor) from a minimum of two to a maximum of five years. SSP protects customers from potential price increases of spare parts due to factors such as foreign exchange. Based on Ford Philippines’s computations, owners stand to save up to 15 percent when availing of SSP. This is on top of the 17 percent savings under the new reduced scheduled service maintenance package. Under the Ford Scheduled Service Plan, paying P 115,700 upfront covers a Ranger Wildtrak 3.2’s scheduled service maintenance for five years or 100,000 kilometers, an additional P 110,800 gives the same coverage for an Everest 3.2 4x4, and P 45,900 for an EcoSport. Currently, SSP can only be purchased via cash. However, Ford Philippines is also working on possibly bundling SSP together with a car’s monthly financing. “We [Ford Philippines] are giving our customers in the Philippines the best products possible and now, we also want to give them the best ownership experience possible as well. We sat down and worked with our dealer partners to make this work,” said Mr. Lessard. In the lead up to Mr. Lessard’s appointment as Ford Philippines’s Managing Director in July of last year, it’s been noted that his predecessor, Mr. Lance Mosley laid down the foundations to improve Ford Philippines’s aftersales service. Now, Mr. Lessard is set to continue this and address Ford’s perceived weakness in the area of aftersales service. With extensive experience working in that very field as well as experience in working to improve relationship with dealerships in North America and Europe, Mr. Lessard brings with him the right expertise to make this work. It's not an April Fool's joke. However, we did ask for the exact per interval breakdown so that we can confirm the numbers. As you can read at the very bottom: they've been denying our requests so far. yep that's why it was a joke... well, ford service has actually been a joke for a long time now! What about they're so called North American cars, ie. explorer, exped, Mustangs? Currently, Ford is working to include the North American units as well. This is a good idea provided the car doesn't kill itself as a result of shoddy engineering. Heard a lot about the "Powersh*t" DCT issue and the Focus RS head gasket problems in other markets. But I guess it's a start. KakapaPMS ko lang last week at pinakita ko ang article nato, imbes na bumaba ang presyo ang sabi pa sa akin ay tinaasan daw ng Ford ang presyo ng PMS nila. Ford aftersales service is always an April fools day everyday. Regretting getting a Ford vehicle. Pag meron nagtatanong sakin kung kumusta ang aftersales service ng Ford sinasagot ko na wag na kumuha ng Ford. Your "Ads by Ambient" are all so annoying. Too intrusive. I understand you make money from ads, but you also make money from sponsored content. So, choose wisely the ads you place on your site. Just my opinion.